This has been a tough year. Personally, professionally, and, well, in general. Where to begin. My grandmother died (as did my Uncle Wayne) and among other talents we lost Gene Wilder, John Glenn, Prince and the guy who played Preacher in Firefly*. Also: Mythbusters went off the air and The Nightly Show was cancelled when we needed them the most. And I didn't even get to the election. But before we join the voices of Amy Schumer, John Oliver and others who are rightfully extending the middle finger to the calendar year let's realize that not only were there some good things about 2016 (Visiting Japan, biking in the UK and Cranksgiving San Jose to name a few) there are better things to do than find a baker willing to put a swear word on a New Year's Eve cake. One of the cool things that happens when you move to a new city is you meet new people. An even cooler thing is when you meet new people and find out they also know other people you've already met. Like Cellista, the cellist who the founder of Cowgirl Bike Courier once carried on a cargo bike while she was performing. I met her through him - but also know her through Be The Change Yoga in San Jose (And regular yoga is a good thing - I'd be in a Nerf Hilton if not for Be The Change). 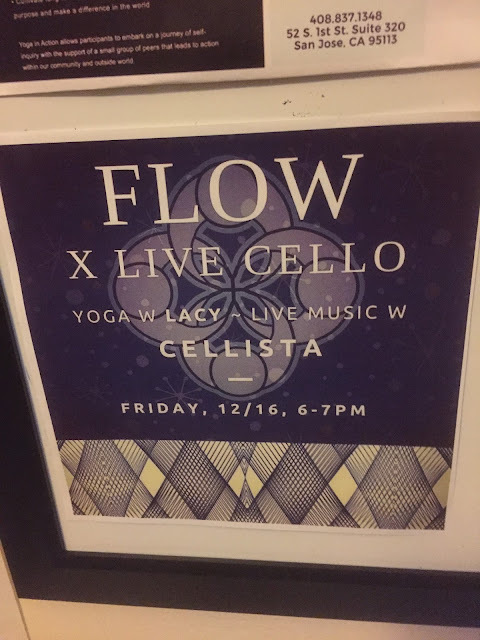 Tonight, from 6 - 7pm there is a Flow class and Cellista is performing live. Hear the music. Move your body. Sign up here. After listening to the talented Cellista, take off your yoga clothes and put on the ugliest Christmas sweater you can find so you can join San Jose Bike Party's Ugly Sweater Ride at 7:30. 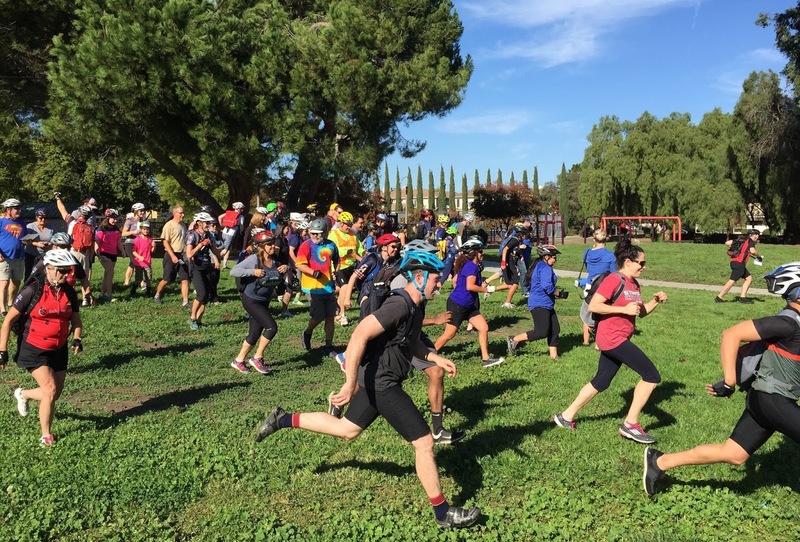 It starts at the Children's Discovery Museum parking lot at 180 Woz Way so you'll easily be able to bike that distance from Be The Change in time to catch the start. 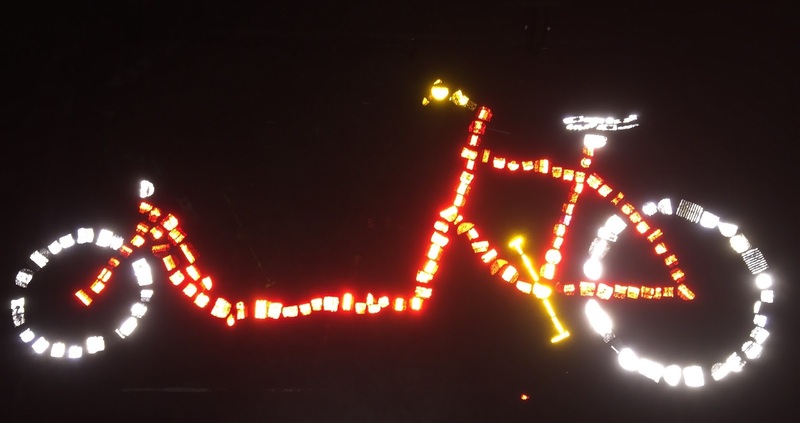 It'll be a great chance to see bikes (and people's homes) decorated in Christmas lights. 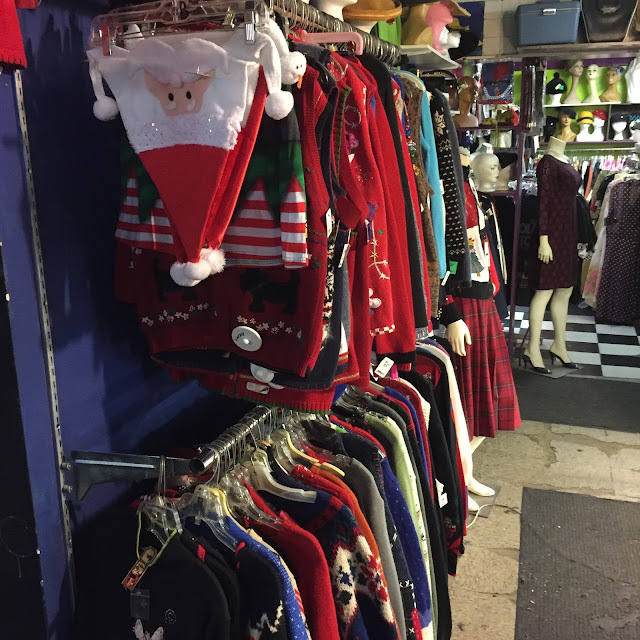 In the event you do not have an Ugly Christmas Sweater I highly recommend MoonZooom on 1630 West San Carlos Street. There is a bike rack right out in front and a generous selection of so-bad-they're-good Christmas sweaters inside (that's where I got the picture). Since my 'No Words' Sandy Hook ride I did in Connecticut a week after that horrible day in 2012, I try to donate at least one toy at a toy drive every Sandy Hook anniversary. That's what I did on Wednesday. In general, it feels good to shop for a toy (I always buy one I'd be excited to play with as a kid) and realize a child you never met is going to have a happier Christmas because of you. I bought my toy - I opted for a Knex kit since I was raised on Capsella and Robotix as a youth - at Target. 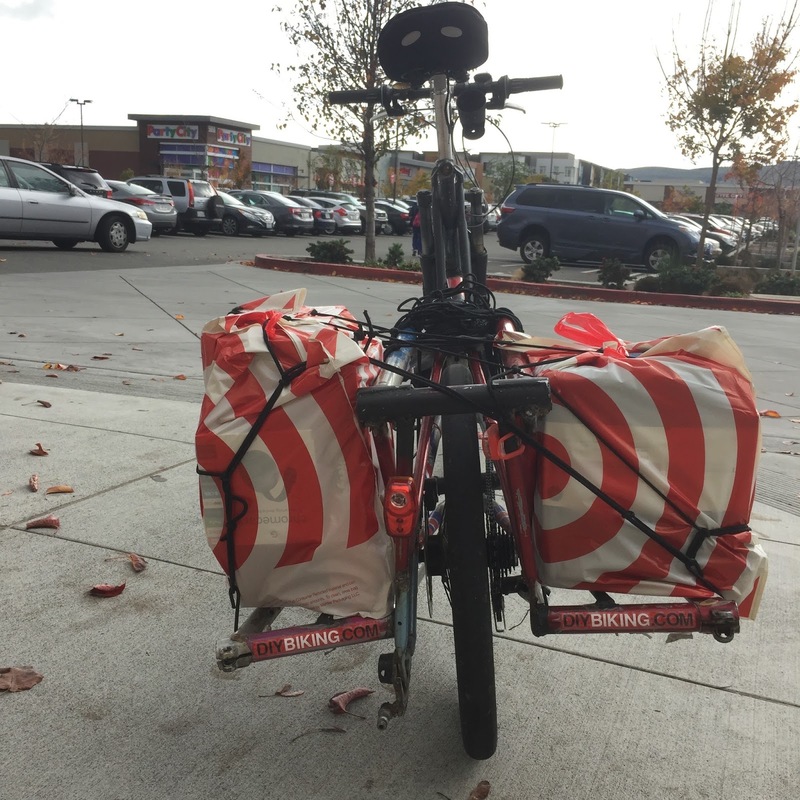 As always a cargo bike is a perfect way to not only avoid fighting for parking spots but also carry your stuff home. At home, I switched to faster equipment - my city bike - and took off to Hub's Coffee on Blossom Hill Road. When I got inside I was pleased to see the bucket they were using to collect donated toys was overflowing, and I hope visitors to Hub's between today and Saturday make it overflow even more and catch Santa's visit (he'll be at Hub's on Saturday, December 17th from 1 - 3; follow Hub's on Facebook for more details). This is taking place on Thursday, December 22nd between 8am and 6pm at Sacred Heart Community Service at 1381 S. 1st St. I've seen pictures of bike builds done at Elves & More in Texas and always thought they looked fun. This is a great chance to take part in one and help kids get one of the most important gifts in their lives. Volunteer to help Good Karma Bikes' mechanics and unload bikes with any one (or more) of three shifts: 8am - noon, 11am - 3pm and 2pm - 6pm. You can sign up for a shift on the Good Karma Bikes' web page and email Collin@goodkarmabikes.org if you have any questions. We can spend the last two weeks of the year being miserable about the previous fifty or we can stand up, listen to music, wear ugly Christmas sweaters, have fun and #Make2016GreatAgain by helping people who are having a much worse year than any of us. Thanks for reading and thanks for riding. * His name was Ron Glass - some of my older readers know him from Barney Miller. 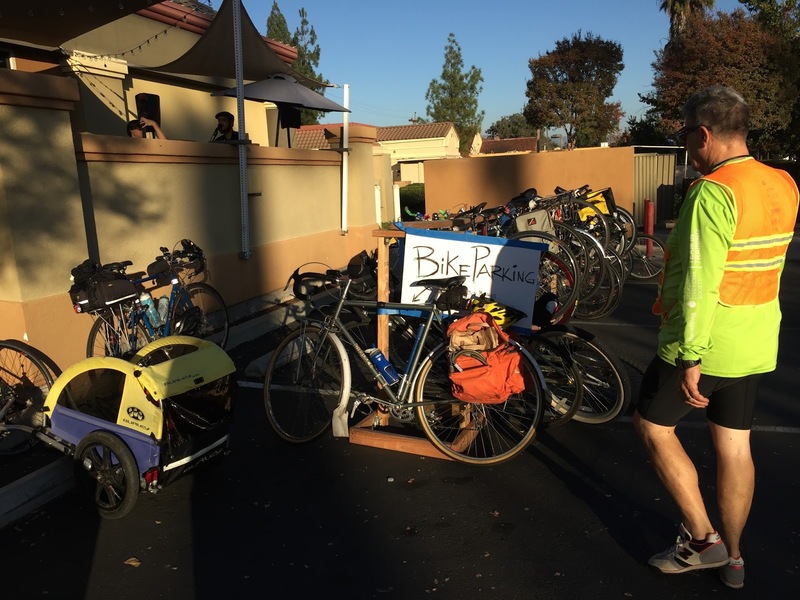 This post is about Cranksgiving San Jose but it needs to begin with this message: two days prior to this amazing event, a man named Leonardo Jeronimo was killed when an out of control SUV crashed into the Alliance Credit Union office at Curtner Avenue. I did not know Leonardo - who was doing his job (painting the office) at the time of his death. But one of main organizers of Cranksgiving San Jose knew him, and the weight of what had happened to Leonardo - who was married with five children - was visible when I saw this person the next day. A fund has been established to help Leonardo's family. Please donate something then share the link. You know those feel-good stories about a fundraising record that is completely smashed? Let's be that story. Please help Leonardo's family. Thank you. 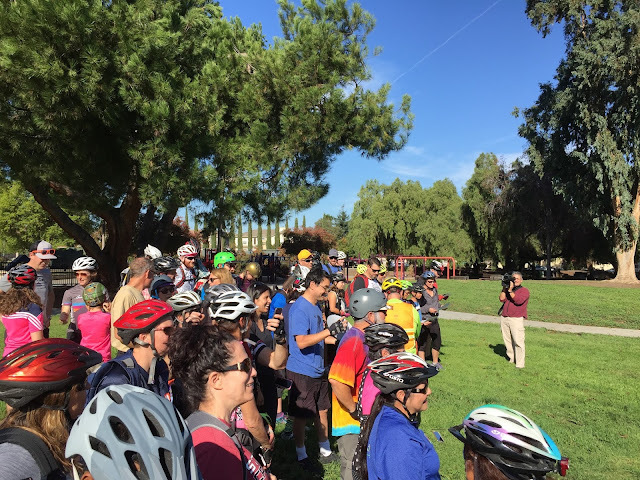 Cahalan Park, November 13th, 2016 - the first Cranksgiving in San Jose. 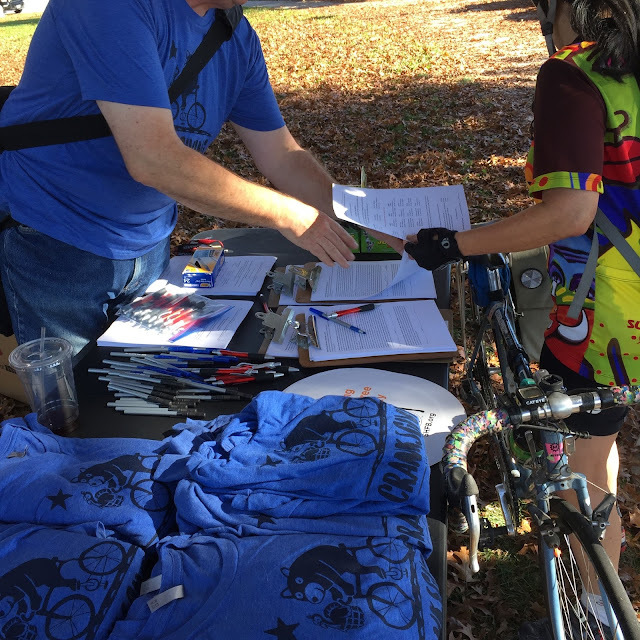 In case you’re joining DIYBIKING.COM from a long absence: I signed on as a sponsor and as a volunteer for Cranksgiving San Jose. Cranksgiving is an annual bike-based food drive that originated in New York City in 1999 and even though I had done a few deliveries to food banks on a bikes before, this was my first time involved in Cranksgiving. Thanks to an invite from Cain, the owner of San Jose’s Cowgirl Bike Courier, I got to be among a small handful of eclectic cyclists at the kickoff meeting run by Erin - who started the initiative here in San Jose in the first place (and, who I quickly learned, was an organizational and inspirational Jedi Knight). At the first meeting we all introduced ourselves and were charged to find sponsors. I became a sponsor myself (as DIYBIKING.COM) and reached out to Good Karma Bikes, which signed on as well. 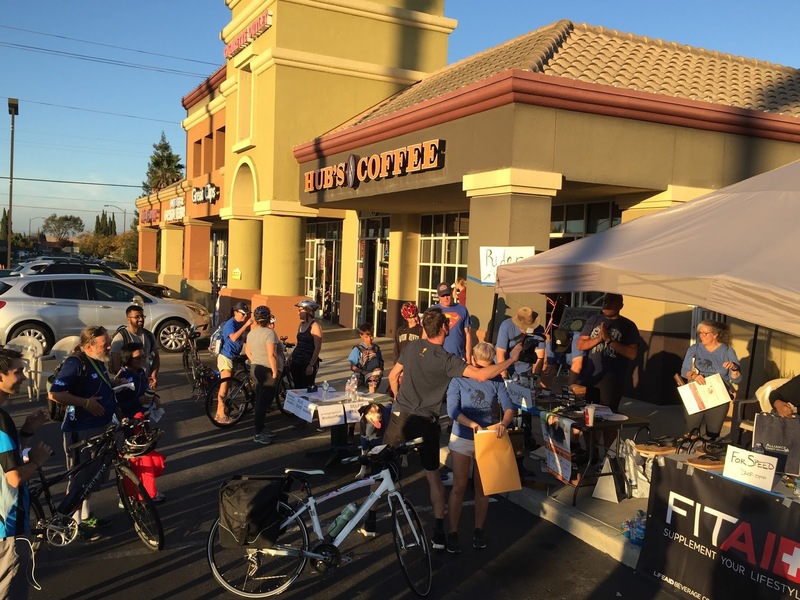 Hub’s Coffee was already on as the presenting sponsor and others were able to get gifts and other support from a wonderful and a wide-ranging list of organizations. The idea was there would be prizes for two divisions - speed and heavy haul - and raffle gifts too. Next came promotion. 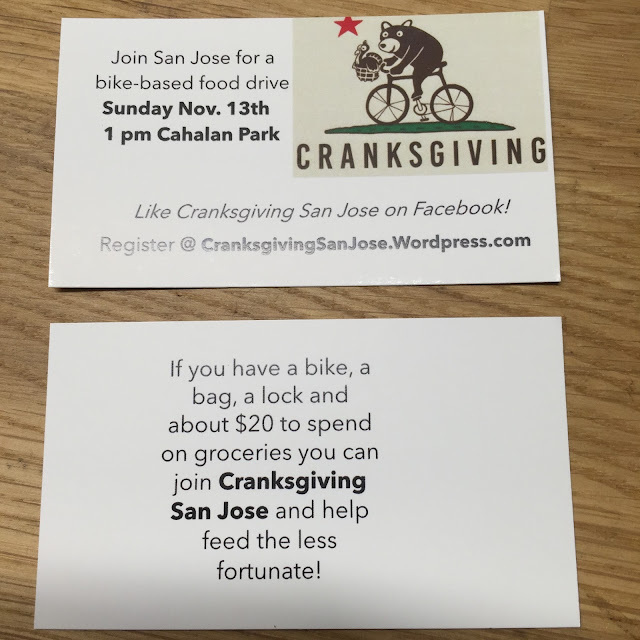 I was given full run of Cranksgiving San Jose’s Facebook page and over an episode and a half of ‘Breaking Bad’ I hand-lettered my bike trailer and made Cranksgiving ‘business cards’ to hand to people who’d ask me about it (and they did) and of course spoke loudly and often at the Bay Area Cargo Bike Festival. As I did last year when helping Good Karma Bikes promote their move to their location on Lincoln Avenue, I reached out to several Silicon Valley journalists I’ve met - including Garvin Thomas of NBC Bay Area News - to try and sell them on the concept of covering Cranksgiving San Jose. 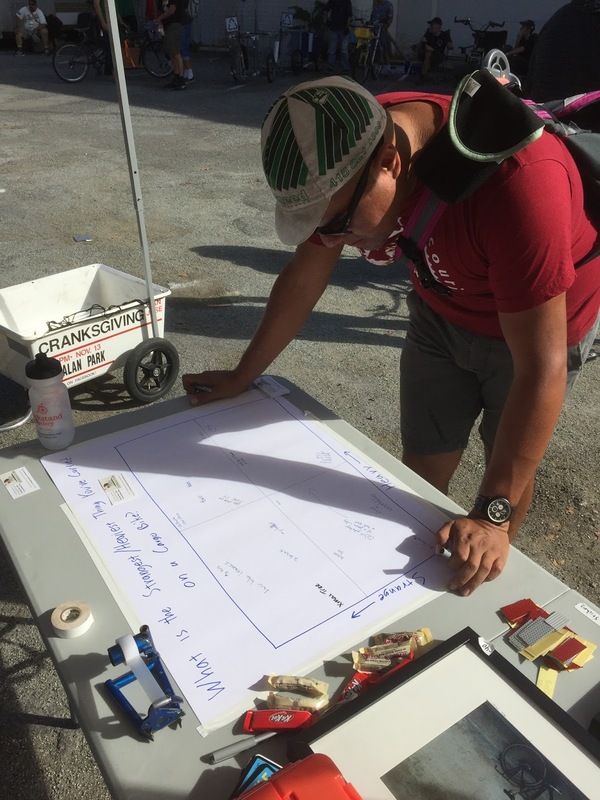 While the other volunteers were recruiting riders and gathering some impressive donations to be used as prizes, I missed the meeting where the central goal was to plan the manifest - which is the top secret list of grocery stores one could visit. When Cain pointed that out to me when I saw him at the Cargo Bike Festival, I realized I could not only volunteer and sponsor - but also participate. In the days leading up to the event I engaged in some last-ditch efforts to get reporters to come. And it was last Friday afternoon when Garvin Thomas sent me a note asking me about our Saturday planning meeting as well as the event itself. About to sit and watch the incredibly important documentary 13th, I quickly jotted down my response, gave Erin a headsup, and put the phone on silent for the movie. 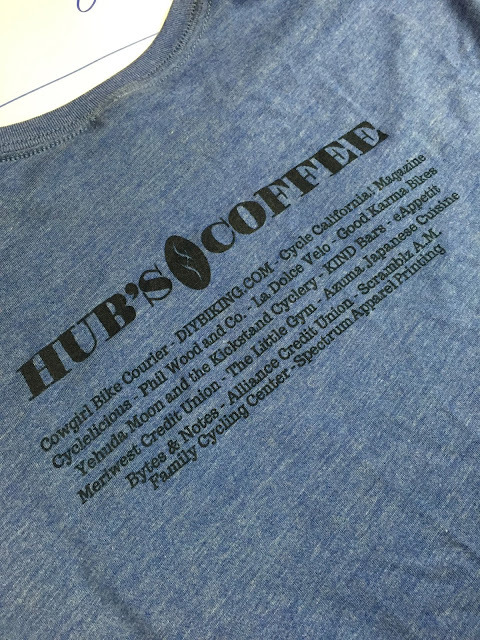 The next day I attended the planning meeting at Hub’s Coffee and was delighted not only that the T-shirts that were made looked fantastic but we had a lot of prizes donated thanks to the sponsors. Garvin was also there filming and we also had several great students from San Jose State University who were attending the meeting and would be volunteering the day of the event. My chief function that day was to help bag prizes and sort T-shirts so half could be sold at the registration table at Cahalan Park and the rest at a table at Hub’s Coffee, which was where we were meeting and where the event would end. I liked seeing DIYBIKING.COM on the back of a T-Shirt (which, for those of you who are considering becoming a sponsor for an event like this, is good enough reason to do so). 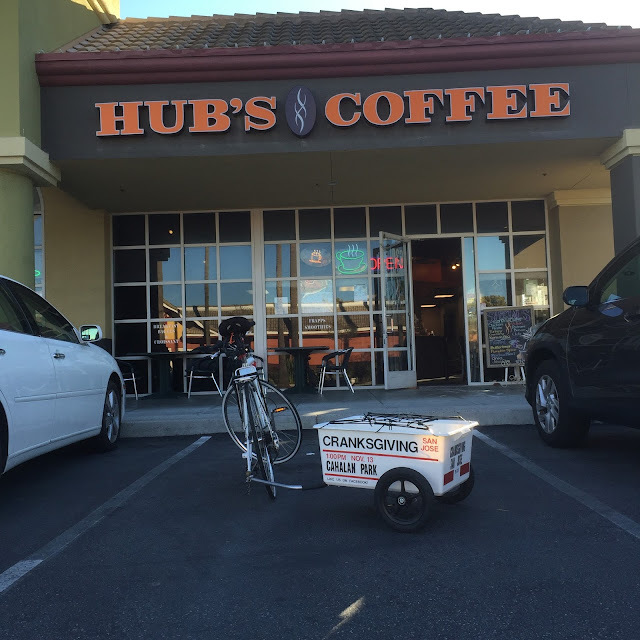 The day of the event I rode my homemade California cargo bike and trailer to Hub’s Coffee to drop the latter off so it could be used at the weigh-in area as a sign. With an improved drag coefficient - and two blue IKEA bags strapped to my cargo bike for my groceries - I set off to Cahalan Park to register. Because everything was under control there wasn’t much for me to do as a Cranksgiving sponsor or a volunteer. But there was one thing I could do as a participant: study the manifest and plan my route. Even though I was entering the Heavy Hauler competition and theoretically didn’t have to race against the clock like the Speed people were, I wanted to return as quickly as possible to remove my participant hat and put my sponsor/volunteer one back on. I studied the manifest which included a list of sixteen grocery stores (we had to pick a minimum of four to go to) and a list of specific food items that we were charged to get. As a person who has lived in San Jose for seventeen months I had been to maybe two of the stores - and I barely knew where they were. Briefly I was reminded of the stressful summer of 2015 when I couldn’t travel further than five miles from my home without using a GPS. With little power on my phone and no regard for my data plan I punched in a few of the addresses in a halfhearted effort to find the shortest route. 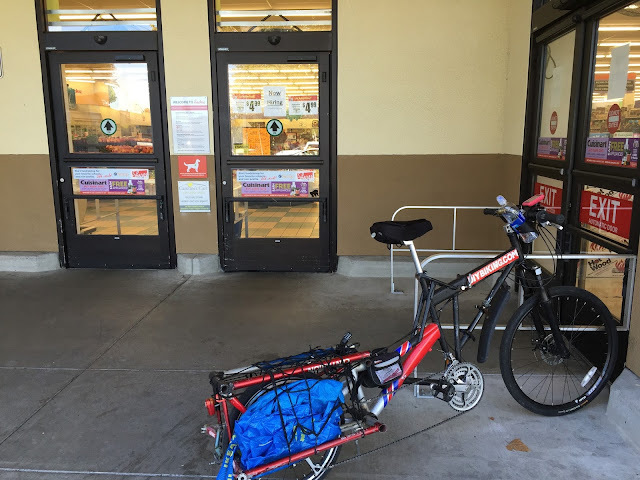 I ended up making guesstimates as to what route would get me to the four stores I chose the fastest, and reasoned that if I could buy just over the minimum - four items - at the first three stops and just overload my bike at the last one to minimize carrying a lot of weight over a large distance. I also, of course, decided to go to the furthest grocery store first. I had a lot of confidence in myself. When I was a kid growing up in Connecticut my dad and I did all of the grocery shopping. On Saturdays we’d go in our Ford Econoline van to a store, and he’d tear off a page of a tractor-fed dot matrix printout of the grocery list which had (and I swear this is true) a list of common food items organized by which aisle in the grocery store they were found in. This list, perpetually affixed to the refrigerator with a magnet, would enable one to use a nearby yellow highlighter to mark food item the family needed. With a printout in hand, I’d weave through the aisles gathering grated cheese, milk, or whatever it was I was charged to find and then locate my father so we could either finish shopping together or he could tear me off a new page of the list that I could try to tackle alone. So yeah: going in I thought I had this in the bag. My confidence did become rather dented at the sight of a couple of Yuba cargo bikes - and the arrival of this three-wheeled ringer. Before I could even the odds by lashing an empty Dumpster to the back of my cargo bike, we closed in on the 1:00pm hour and were instructed to leave our bikes under a tree and gather on a nearby hill. Using a borrowed bullhorn that she quickly realized was unnecessary, Erin gave a stirring speech to the crowd while Garvin's camera rolled. Then, we were off and running down to the hill to mount up. I hastily threw a few of the pictures I took onto the Cranskgiving Facebook page and jumped on my bike. The first place I wanted to go was a Lucky’s a few miles south. Under a beautiful sky and among a few other cyclists who had also chosen that location as the first stop, I raced ahead and locked up out front. Upon entering, I immediately noticed I wasn’t the fastest. A couple of cyclists were already in line at the checkout and a few more were race-walking through the aisles to find the approved food items. I had to admit it was intoxicating to enter a grocery store with the lens of a game show contestant instead of trying to remember if I had milk or not (NBC's Janelle Wang later mentioned on the air that Cranksgiving San Jose looked fun and I can assure her: it is - and I hope you follow Cranksgiving San Jose on Facebook and do it with us next time). 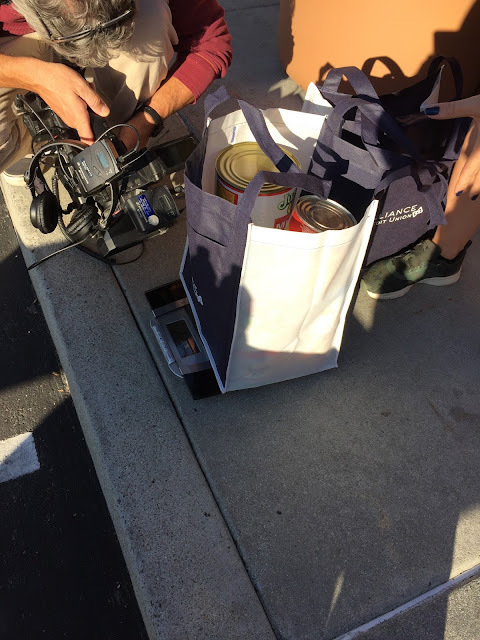 I grabbed the first items I found that were on the approved list - four cans of pineapple and four boxes of spaghetti - and headed to the express lane. 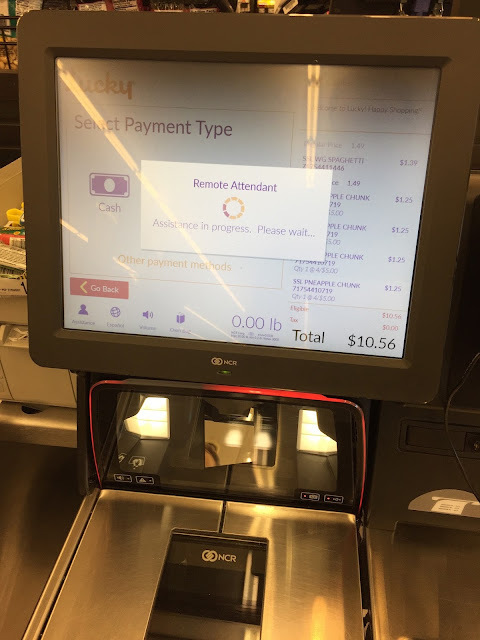 Even though I knew I wasn’t, technically, racing the clock, I was still feeling a spot of panic when my self-checkout counter malfunctioned. There was nothing I could do but wait for a very nice attendant to walk over and ask me a familiar question. For the last time, Lucky’s: No I am not collecting the stamps! I'm not even sure what they are. Postage? I'm not collecting them so please stop asking me! I'll keep shopping there because you have the good sense to make all the different blends of coffee the exact same price - but leave me out of the stamp thing! Outside, I realized what my personal bottleneck was going to be. The bungee cargo netting I keep on my cargo bike at all times kept trying to pull the spaghetti into my spokes. As much as I use the bike for my own grocery trips I’ve never carried food in shapeless IKEA bags before. I felt I was struggling with a bean bag chair filled with rocks. Once I arranged the food so it wouldn’t create a spaghetti incident (hey - that sounds like a great name for an album, doesn’t it?) I headed off to the next store - Lunardis. Here I ran into even more cyclists, and we all had that frenzied, hurried, and happy look on our faces. After grabbing more food (I ruled out graham crackers since I worried my bike's stiff ride would turn them into graham cracker atoms by the time I finished) I checked out without incident and, after remounting, got ready to make a U-turn as several other bicycles - including the pedal powered Doof Wagon I've seen at San Jose Bike Party Rides - turned in the other direction using the right lane (the picture below is the one I took at the start). I've seen it at San Jose Bike Party and it looks even better at night. And yes that is a fog machine. 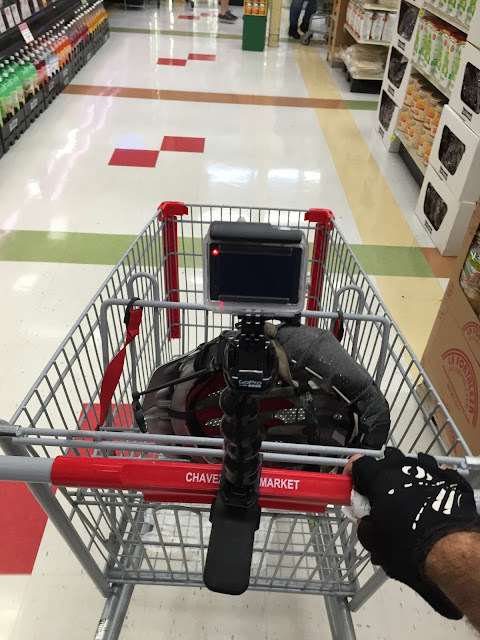 When I finally arrived at Sprouts I took a GoPro inside as to capture the spectacular drama and breath-holding action that can only be described as grocery shopping on a Sunday afternoon. Other shoppers gave me a noticeably wider berth - especially as I gave running commentary. As with Lunardis I ran into other friendly Cranksgivers as I hurried along. Finally, it was time to go to Chavez Supermarket on Blossom Hill Road, which is in the same plaza as Hub’s Coffee. Unfortunately, I became lost on the way there and ended up pedaling over two miles to correct my mistake. When I finally arrived at Chavez, I found the front jammed with bicycles belong to other Cranksgivers - meaning I wasn’t alone in my load-up-at-the-last-stop strategy. I pulled out my now wrinkled, sweat-covered manifest and zeroed in on food items I didn’t already collect. I could hear my sneakers scuffing on the floor more than I did at the first store. I was running low on power. I got a shopping trolley and picked up more food than I had gathered on my first three stops combined, scanning the aisles for empty cardboard boxes I thought would be easier to attach to my cargo bike. Finding none, I figured exactly how much food would tear through an IKEA bag - and subtracted one can of peanut butter. In line, an ecstatic cyclist ahead of me was explaining Cranksgiving to the amused young grocery clerk, whose smile got bigger as their exchange went on. When I finally made it outside, I again played grocery Tetris to make sure all my food - I had no idea how much I had gathered at this point - would stay in place. 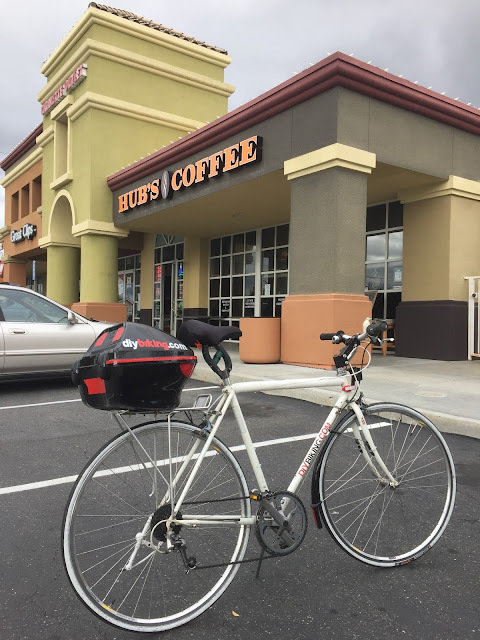 I mounted up and pedaled to Hub’s Coffee. “Another heavy hauler!” Someone shouted excitedly. I braked and was nearly out of breath due to the cumulative efforts to gather this much food. The tireless and inspiring Erin helped balance my food on the borrowed scales while Garvin Thomas filmed the event. I briefly handed over my receipts to prove in fact I had traveled to the shops on the list to get my food. A moment of panic hit when I realized I couldn’t find my manifest. Lucky for me a cyclist I had never met before (who arrived moments after I did) handed it to me with a smile, saying I had dropped it while in line at Chavez. My weigh in for the very first Cranksgiving I had ever taken part in was 49.7 pounds. I had nothing to compare that figure to so I could only wonder if I could top that next year. Again I asked Erin, Cain and the owner of Hub’s if I could help with anything and they - and the fantastic San Jose State University students - assured me I didn’t need to put my volunteer hat back on just yet. I entered Hub’s so I could plug in my dying phone and recharge with food and a cold drink from one of the incredible staff members. While inside, I watched as more food came in and was placed inside the drums Second Harvest Food Bank had provided. The contents of what I saw gave me hope that this was going to be a successful first Cranksgiving San Jose. I stood near the front of Hub’s taking photos for the Cranksgiving San Jose Facebook page and was in awe. Riders from all ages, many races and, judging by the equipment they were dismounting - many income tax brackets were coming in. It made me smile for the first time in nearly a week. On social media I’ve seen the #WeAreSanJose hashtag but never really felt like I knew what it mean until that afternoon at Hub’s Coffee. Even though the sun was beginning to set nearly all of the riders stayed for the awards ceremony. 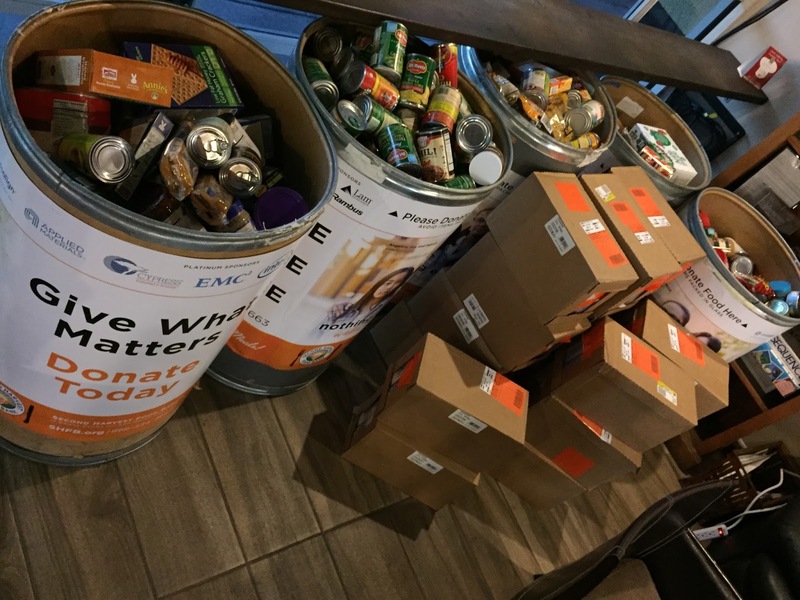 I came in a distant third in the Heavy Haul competition but it was much more fun watching it all and learning just how much food we had all gathered for Second Harvest Food Bank. All of us began looking at each other and realized the same thing: cyclists getting together to use their bikes for good is the prize. That and gathering enough food to dent the earth's crust. 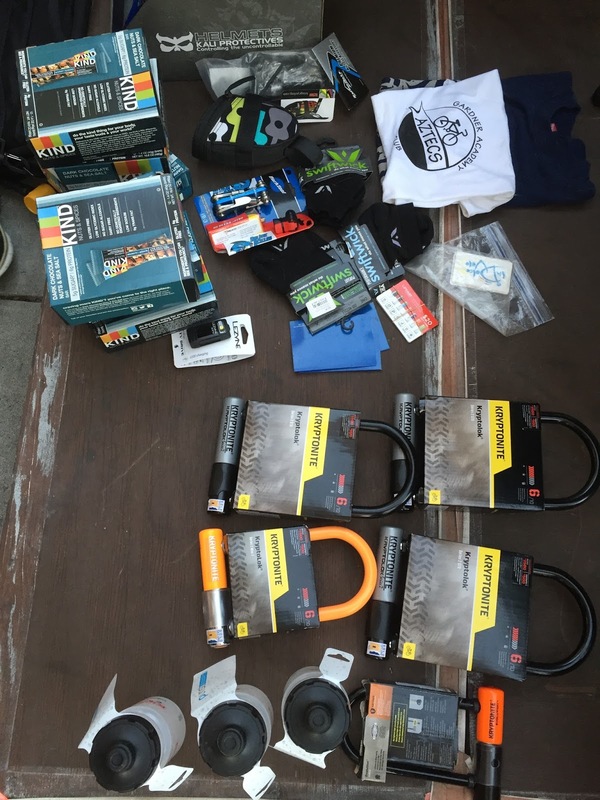 Thanks to the amazing generosity of the sponsors there were more than enough prizes to go around. With laughs and till-next-year promises, the celebration at Hub's came to a close and we all got together to pack everything up. A couple of days later, Garvin Thomas’ fantastic segment on Cranksgiving aired as a Bay Area Proud feature. Today, as I write this, I am feeling Cranksgiving withdrawal. And today, as you read this, you may be feeling sorry that you missed it. 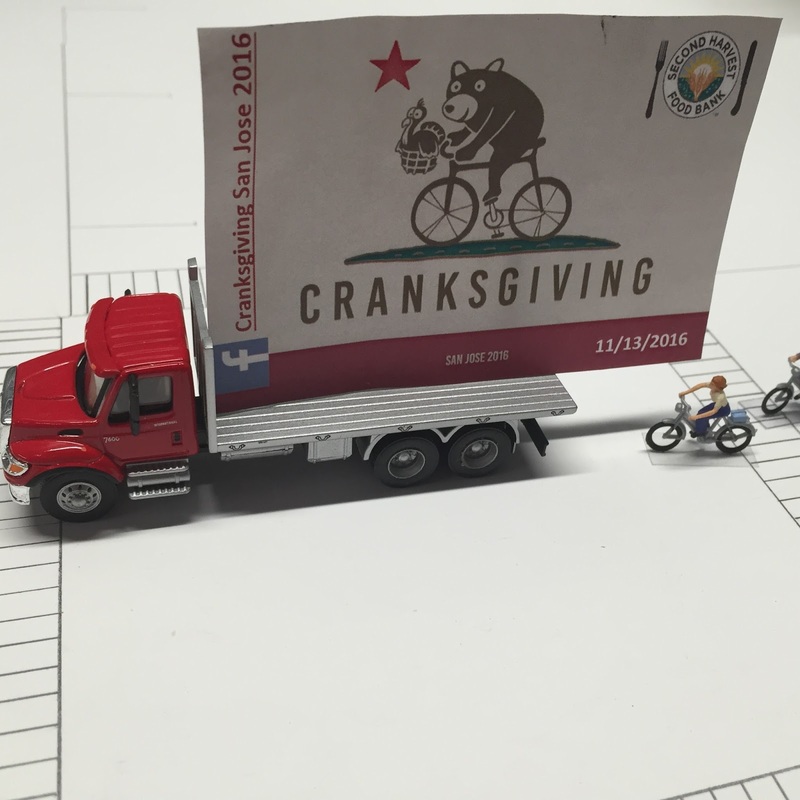 But if you are in a city that hasn’t had Cranksgiving yet look on the Cranksgiving web site to find one near you. I was a sponsor, volunteer and participant. It's easy to do just one of those if you prefer. If you live in San Jose and want to make sure you don’t miss it in 2017, like Cranksgiving San Jose on Facebook and remember: nothing is stopping you from getting on your bike and bringing donations to a food bank like Second Harvest or participating in NBC Bay Area’s own food drive - Feed the Need - which is going on this weekend. 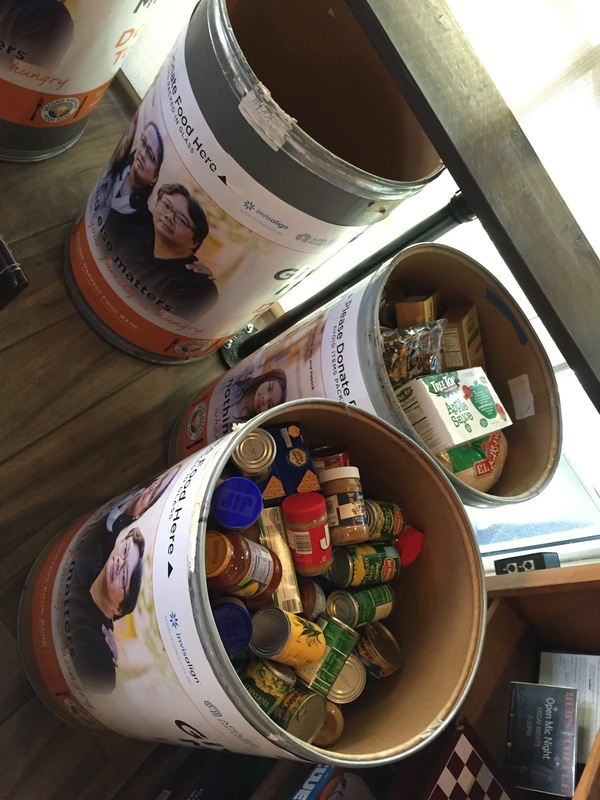 You can also find Second Harvest Food Bank drums to put food in at your local Safeway. 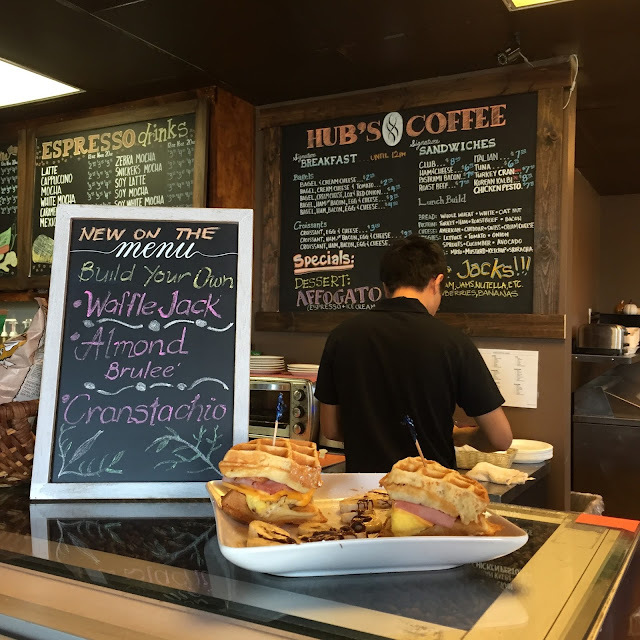 Not only that but Hub's Coffee is having a special deal until November 20th: bring in a non-perishable food item and get 15% off a hot coffee. If you’re like me, you may feel as though a lot of humor and humanity was lost over the course of 2016. Cranksgiving and efforts like it (and any decision you make to #LeaveTheCarTakeTheBicycle to do some good) are a great way for all of us to get some of that humanity back. Mount up and do that right now - and make a donation for Leonardo's family before you go. Thanks for reading and thanks for riding. 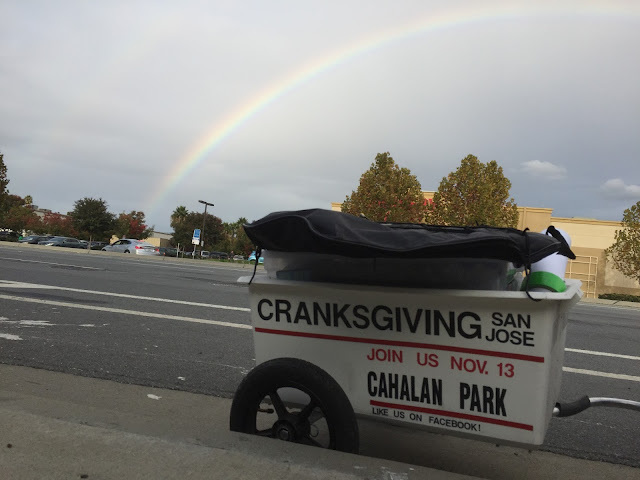 Note: If you are upset, angry, tired or depressed at the result of the election - as I noticed in downtown San Jose last night - please put your energy toward Cranksgiving San Jose - which is a bike-based food drive in San Jose on Sunday. You can register here. And if you are pleased, euphoric, happy or exhilarated at the result of the election put your energy toward Cranksgiving San Jose on Sunday. You can register here. Even if the 2016 election ended another way, there is always talk of unity when one wins and the other is defeated. Hunger doesn’t care if there is a ‘D’ or an ‘R’ next to your name. Hopelessness doesn’t either. Let’s come together Sunday, smash expectations and set an example for how people can unite to help the least fortunate of Silicon Valley. Thank you. 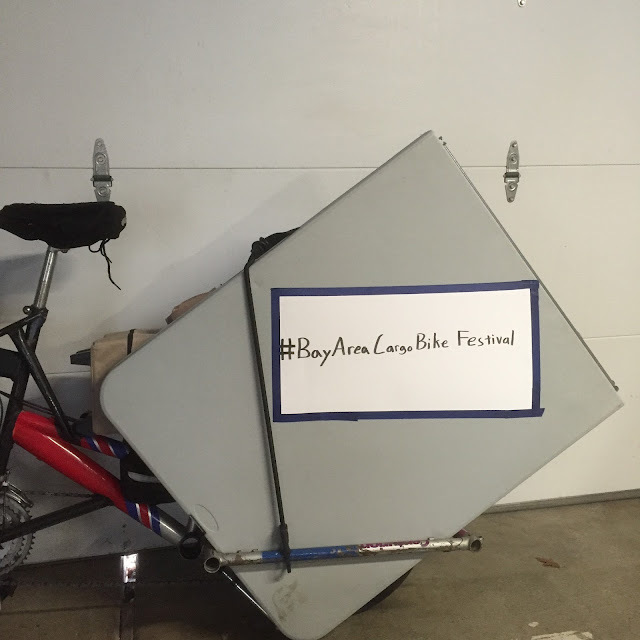 I got to do the Bay Area Cargo Bike Festival last year and loved every minute of it. I met interesting people (one was the owner of Box Bike Collective, who later lent me his excellent signature product which I wrote a two-part review of last year) and I walked away inspired. 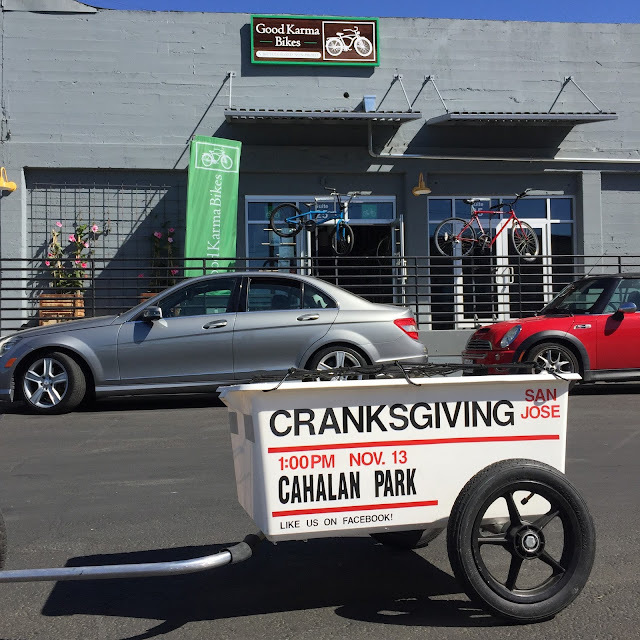 I wanted to do the same this year but with a twist: I wanted to peddle some of my artwork and promote the bike-based food drive, Cranksgiving San Jose, which is coming up this Sunday Nov. 13th. I arranged to have a tent and table at the Cargo Bike Festival with the hardworking founder of the event, Rene. There was one problem: I was sick the previous week with one of those colds that tries to waterboard you with your own boogers from the inside. The entire week I slept little. I ate little. I biked not at all. I also didn’t make any new welded artworks - and I had set aside the week so I could do so. But I was so tired just pulling my Lincoln Electric MIG welder out would require a spotter. 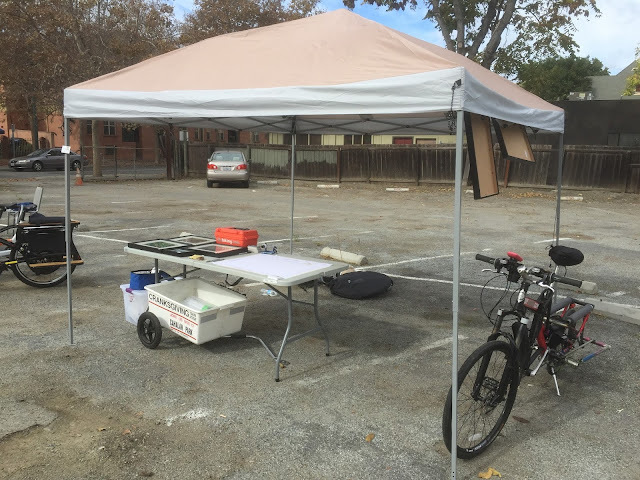 As I closed in on the festival I began to worry I’d have a blank table - or worse, an empty parking spot at the San Jose Armory where my table should be. But by Saturday I felt like I was on the mend. So much so I was sure I could honor Rene’s request that participants should bike to the festival and not drive. 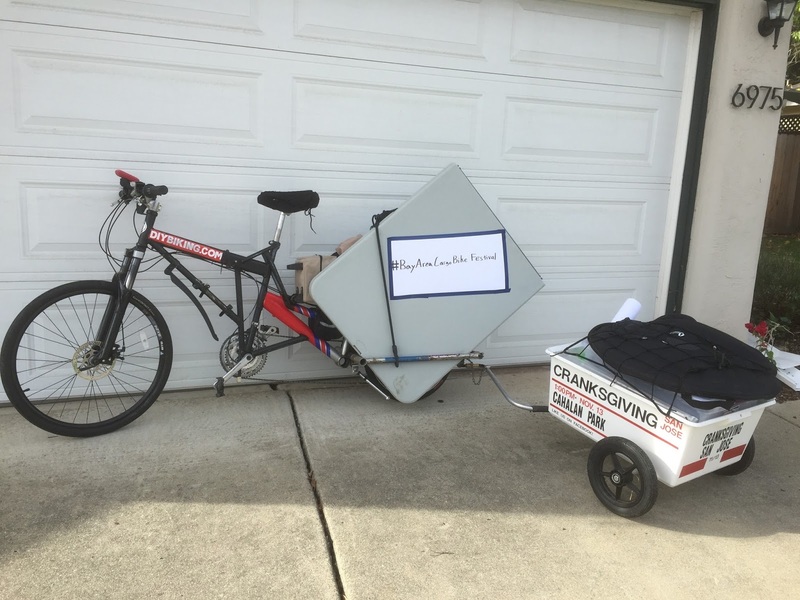 This meant I had to carry - on my homemade cargo bike and on my trailer - my large folding table with metal legs, a 10’ x 10’ pop-up shade, several photographs that were in glass frames (some of which were last seen hanging at Lorca in Stamford during my show in 2014), a Christmas wreath made from the old front wheel of my City Bike and leftover Halloween candy (to my credit: mostly Kit-Kats). I also wanted to give people who visited my table as well as front and rear reflective stickers I wanted to give away to anyone who wanted more visibility for their bikes. That morning I practiced loading the bike up to see how well I could balance it. With the huge metal table jammed on one side it would absolutely not be balanced but I was pretty sure I could ride the 11.9 miles across the city of San Jose safely. I left an hour and a half before the festival would start to give myself - I hoped - plenty of time to get there. Realizing I was giving my creation (and myself) the ultimate test of strength, I set off. The bike and trailer moved slowly, but silently. 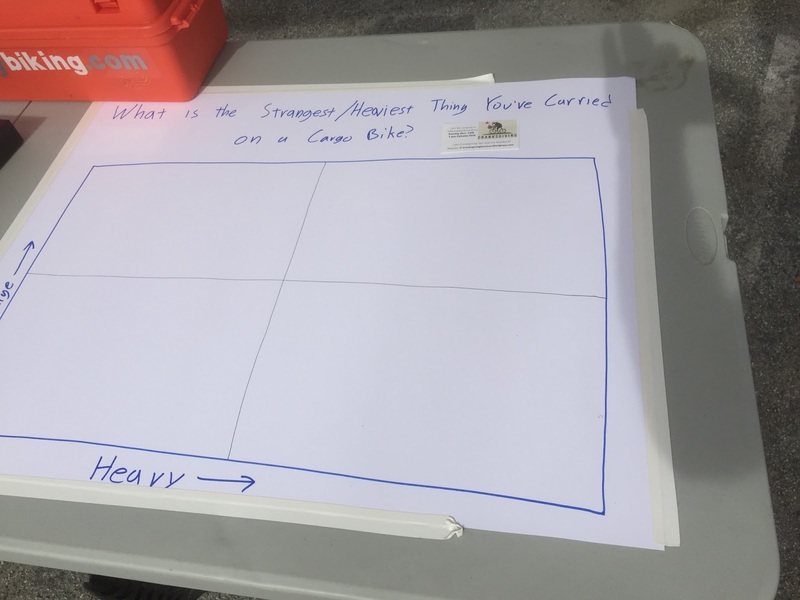 It felt heavier than the 4 x 8 sheet of plywood I carried on the Bikeducken in Connecticut three years earlier. A few miles in I noticed a corner of the table would scrape against the pavement when I’d make left turns. But I was still biking. Since I had taken a Claratin before setting off my snot rockets were at a minimum. I could hear birds singing. I could smile back at the women walking their dogs on my route. I had clean air to breathe. I didn’t have to worry about a parking spot. I didn’t have any concerns about fuel. I was getting exercise. And I was enjoying myself. I did have some concern over my cargo trailer, which was where I had put my framed photographs. They were cushioned but I never realized how bumpy railroad tracks were - and how many of them crossed my path on the 11.9 mile ride - until that day. I made it to the festival fifteen minutes before the start. When I applied the brakes I felt happy I had made it though I was disappointed in the unintentional littering I had done on the way up (my oak tag and electrical tape #BayAreaCargoBikeFestival sign had fallen off somewhere along the route). As I unloaded, more people showed up. A guy who was already there who I had never seen before started to help me set up my 10’ x 10’ tent even though I didn’t ask him to. After it was up he left giving me a smile but not saying a word. Thanks to my cold, I didn’t have enough artwork to fill the table (but all of my photographs made it to the festival unbroken!) However, the day before, I came up with a plan: recalling the 2x2 matrixes I learned about as a research analyst at Kennedy Information - the first job I got when I graduated from college which required me to study the management consulting industry - I put forth the question: What is the strangest/heaviest thing you’ve ever created on a cargo bike? The stranger the item was the higher it would be written on the scale. The heavier it was the further to the right it would be. 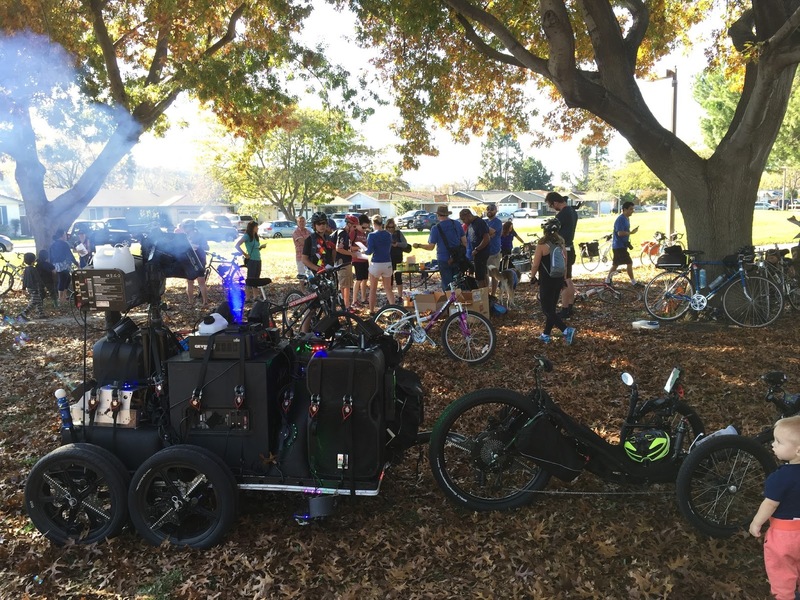 Just like last year I had a great time at the festival meeting fabricators, manufacturers and just fun people who take the #LeaveTheCarTakeTheBicycle concept to the next level. 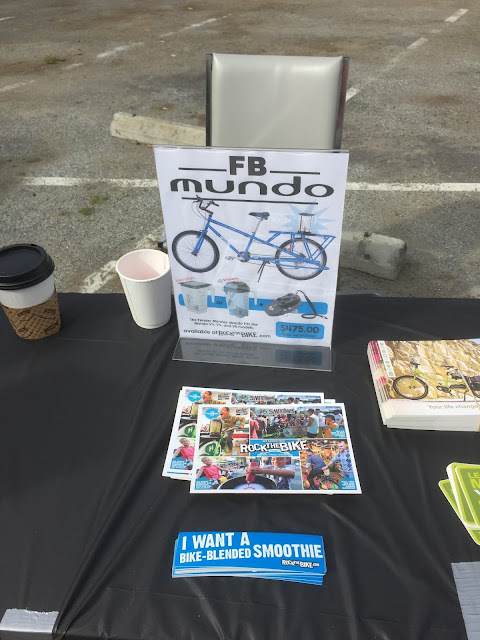 I also discovered that the bike-powered smoothie thing (you can ride a bike hooked up to a blender) is an an actual thing you can buy: Fender Blender Mundo from Rock the Bike. In addition to bike-powered nutrition, I hoped anyone attending would think to themselves that carrying stuff in a small bag from the grocery store or the farmer’s market wouldn’t be a big deal in comparison. Even though my voice behaved like an ornery lawnmower that wouldn’t start on the first pull, I spoke as often and as loud as I could about Cranksgiving San Jose and answered as many questions as I could about it while guiding people to my 2x2 matrix. It was truly enjoyable to watch people think about the strangest and heaviest things they’ve carried and write it down on the matrix. A couple of people wrote ‘groceries’ down on the lower left corner. 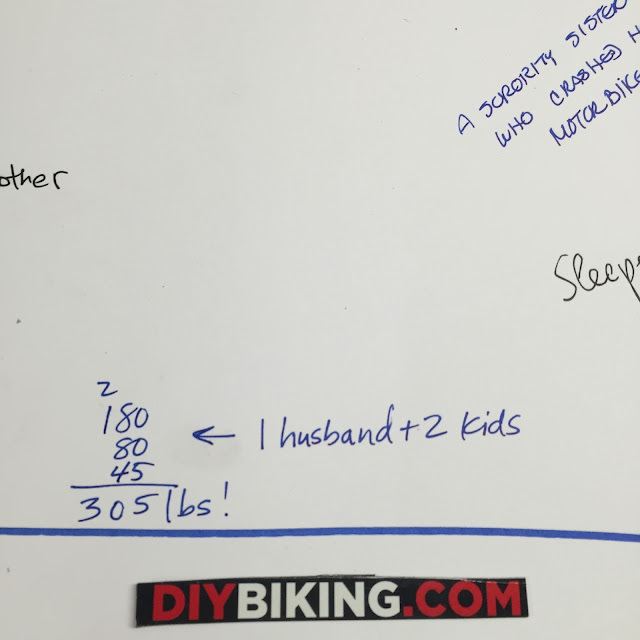 Further up the ‘heavy’ scale was one of my favorites: ‘1 husband and two kids’ - and the woman who wrote that got bonus points for doing the math and showing her work (carrying the ’2’ and everything). When Cain, the founder of Cowgirl Bike Courier (and another sponsor of Cranksgiving San Jose) showed up, he stared at the matrix for a long time - as though it was one of those hidden image posters and he was trying to find the sailboat. He arrived on his CETMA - a cargo bike I was familiar with before I had a chance to meet its owner. You know when a bike is stolen and a friend wants you to share the picture of it on Facebook? That’s what happened - and I wrote about it last year for the bike-light maker, Blaze. Cain wrote down two things: an 8 1/2’ x 11’ painting and, at the very top of the ‘strange’ scale - above ‘worm bin’ and also above ‘old fashioned tube TV’ - a performing cellist. I believed him - but he sent me a picture anyway. 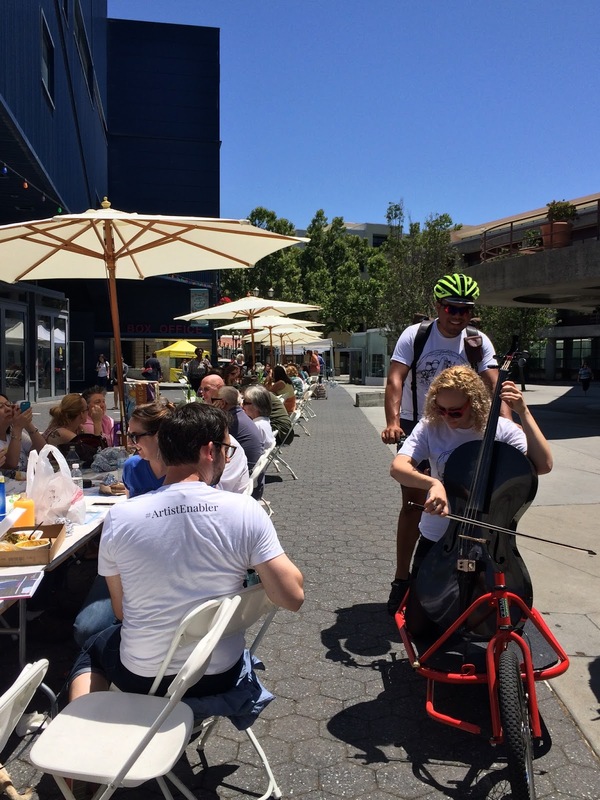 The cellist’s name is Cellista and she is based in downtown San Jose. Check out her music, make sure you follow Cellista on Facebook and come to one of her shows. Just like last year's Cargo Bike Festival - I was inspired. Later on, when the event ended, I packed up everything back on my homemade cargo bike - and was thankful for a lamp post to lean it against as I secured my Grapes-of-Wrath-like load. Hoping to brake as little as possible, I pedaled off; working my way through downtown and heading south on Monterrey Boulevard. And it was there, under a sky that was dark on my right but bright on my left, I saw something on the nearby sidewalk that caught my eye. I did the right thing and applied my brakes and came to a stop so I could pick it up. 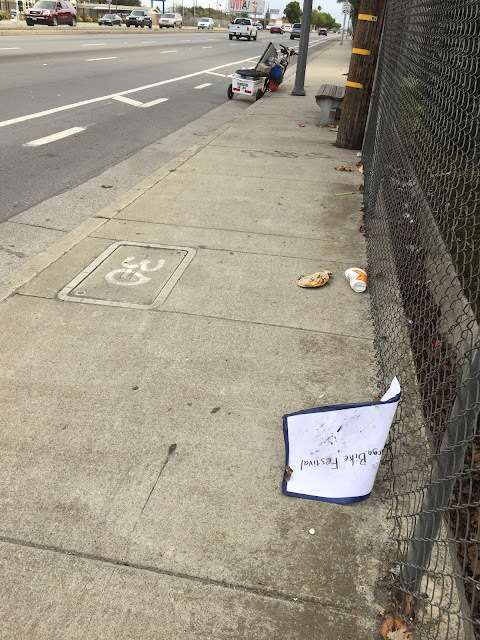 Improbably, the sign I had taped to my bike that morning had been run over several times and, incredibly, skittered all the way over to the southbound lane of Monterrey Boulevard. I got to undo my littering wrong and bring it the rest of the way home. A ride I’ve done in 45 minutes on lighter equipment took an hour and fifteen - but I was still happy in my decision that morning to #LeaveTheCarTakeTheBicycle. 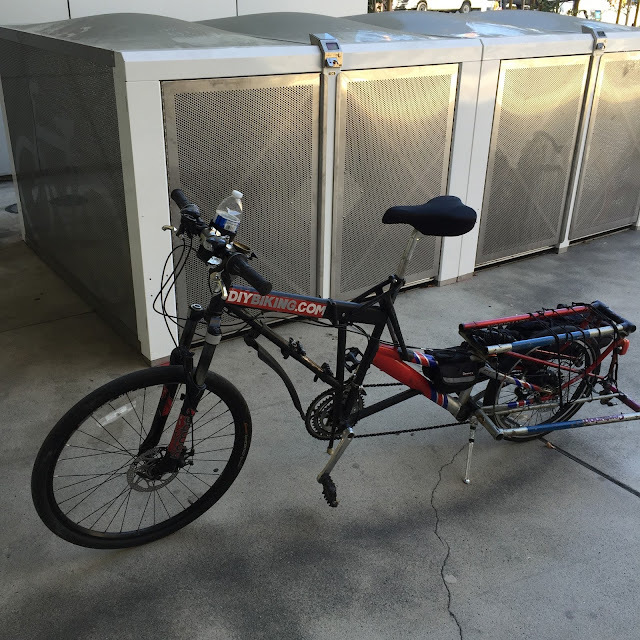 I’ll write about cargo bikes and the matrix more at a later date but for now, I need to leave you - and hopefully leave you inspired to sign up and spread the word on Cranksgiving San Jose. 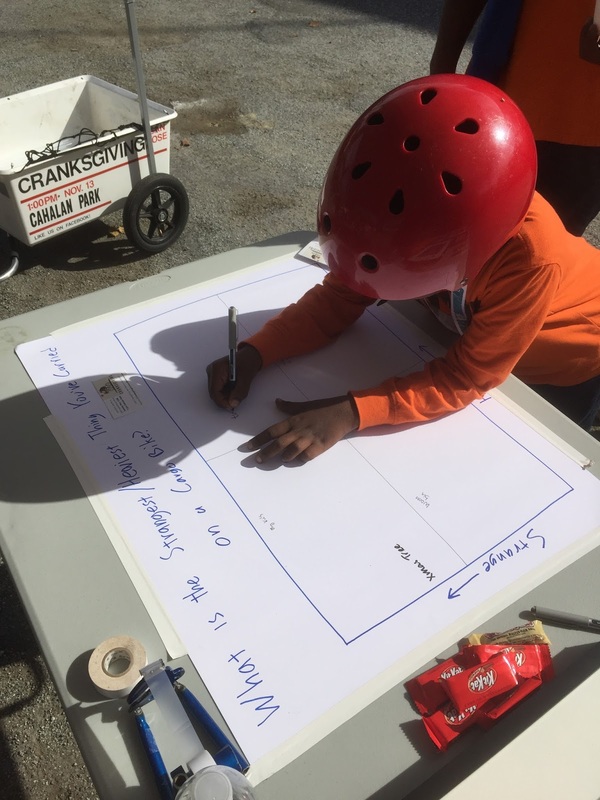 It’s been a divisive election season and a divisive result but it is time for us as cyclists (and human beings) to do something together for a common purpose. Some of you have been carrying a lot on your shoulders this week anyway - so why not add food for someone who needs it? Thanks for reading and thanks for riding. *I’m pretty sure they invented this. Can’t remember the exact person though. Michael Porter? Dominique Mars? It was somebody smart. I remember that much. Reflectors on my shop floor - based on CETMA cargo bike used by Cowgirl Bike Courier. The other day I read a piece in the San Jose Mercury News about the growing trend of the 'megacommute' (defined as a one-way drive to work of 90 minutes or more) of a lot of Silicon Valley workers. I had a few problems with the article. Not at all with how well it was written or the validity of the points made, but the way we tend to look at our traffic problems as a side effect of economic growth instead of looking at it as what it is: a direct effect of our reliance on solo car travel. And yes: more bike infrastructure won't mean much to someone who lives too far from work to pedal there. But if more people get out of their cars and onto a bike the commute for motorists gets easier - not harder. 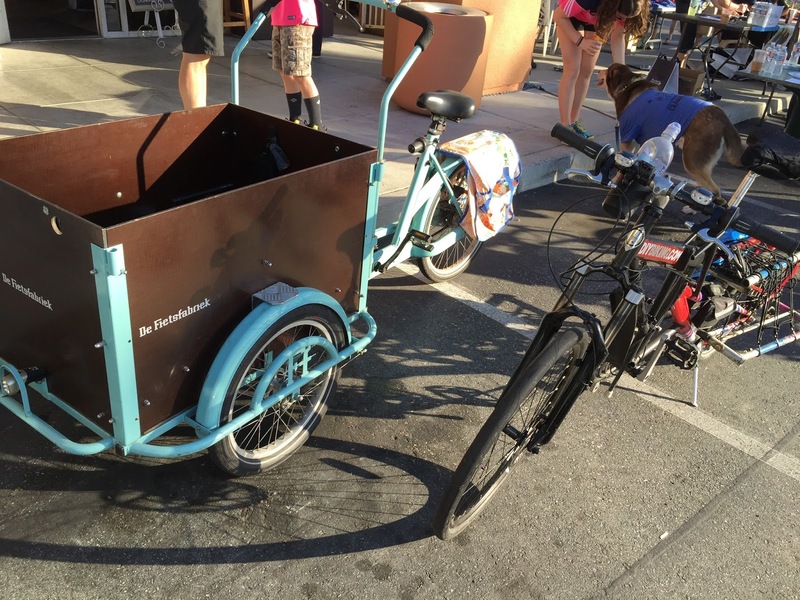 In front of Moonbeans Coffee in San Jose with a Box Bike (photo is from last year when I wrote my review of the Box Bike). There is absolutely no bike rack to be found here so I don't go often. I have pointed out - numerous times - that part of the greatness of bicycles is that they take up a lot less space than cars do. When we think about how San Jose and other cities are laid out there is a lot more room for a motor vehicle that is not in use than there is for a poor family that needs a warm place to sleep. 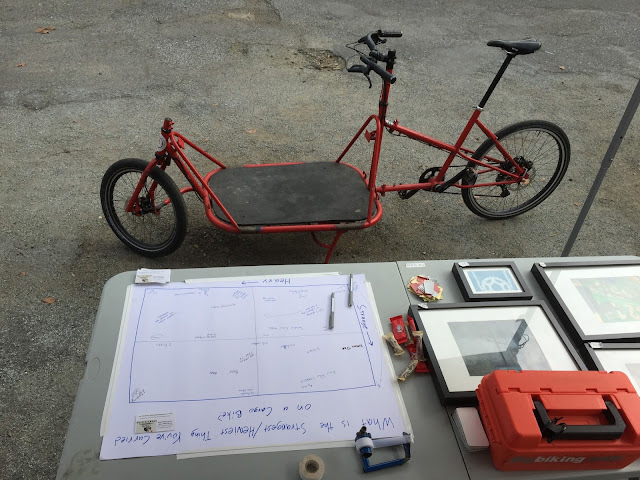 So in the interest of making life easier for yourself (I'm talking directly to the folks reading this who don't ride because they have a lot to carry) and for our community I suggest you visit the Cargo Bike Festival this Sunday. As last year, it'll be inspiring. You'll meet people who like to make, like to ride and want to show you how you can do both. 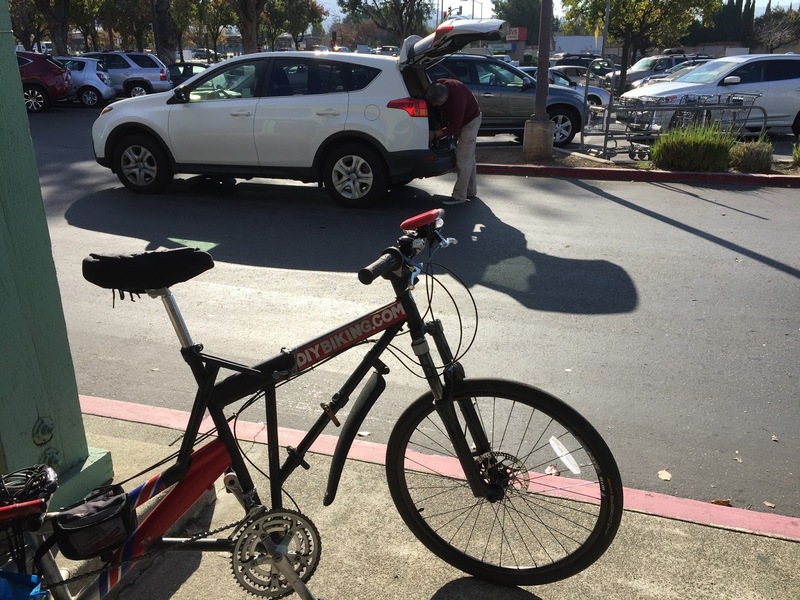 There will be bikes for you to test ride and local businesses and non-profits represented. And when you start to hear and read stories about what people carry on their bikes, the more possible a ride to the grocery store to buy milk is going to seem. 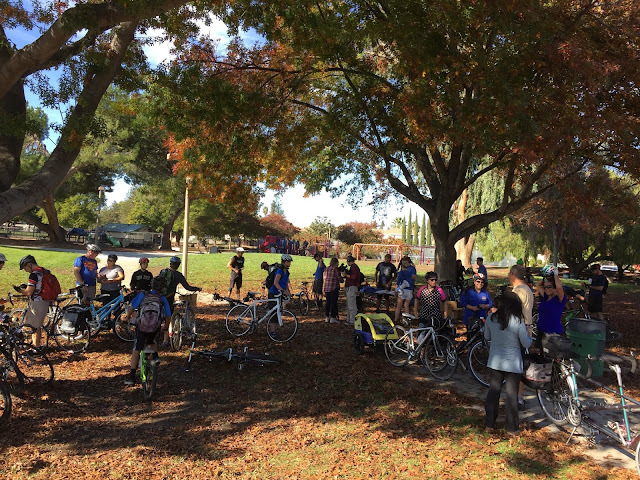 I'll be there too - mostly talking up and trying to recruit more riders for Cranksgiving San Jose - that's still on Nov. 13th. and you can read the piece I wrote about it here. 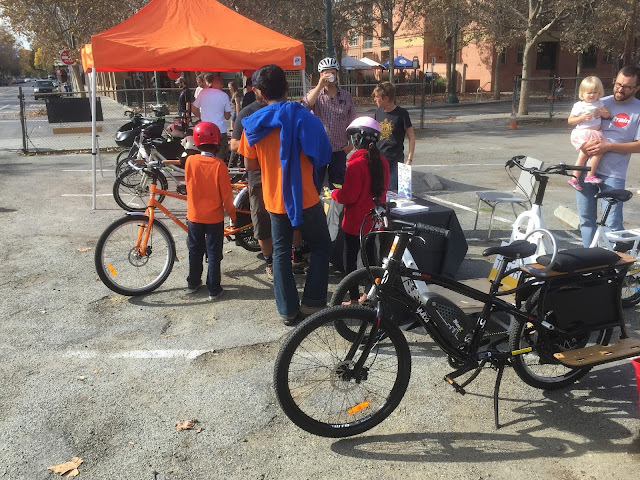 The Cargo Bike Festival will be taking place Sunday, November 6th at the San Jose Armory at 240 N. 2nd Street from 11am to 3pm. Please go and remember: the more you leave the car and take the bicycle the nicer a place to live in Silicon Valley becomes - and maybe this megacommute thing can become ancient history. Thanks for reading and thanks for riding. Back when I lived in Stamford, Connecticut (where I owned several bulky winter coats, seeing a Tesla was hey-look-at-that! rare and I had all the plastic grocery bags I could ever dream of) I brought an entire Thanksgiving dinner to a food bank in a bike trailer I made. I called it the DIYBIKING.COM Thanksgiving Dinner Challenge. It became an annual occurrence for me, and before long People Friendly Stamford got involved. 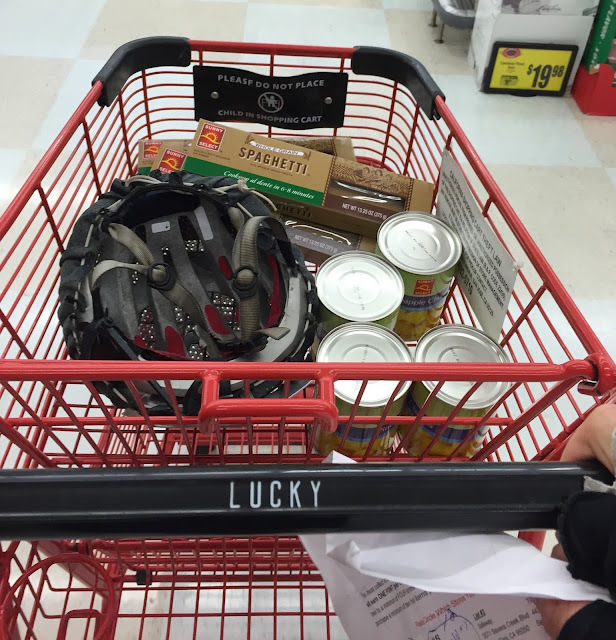 I named it Food Bank Biking, and decreed it would be an annual event done on the Saturday before Thanksgiving. I did it in solidarity with People Friendly Stamford when I was in Cleveland one year. 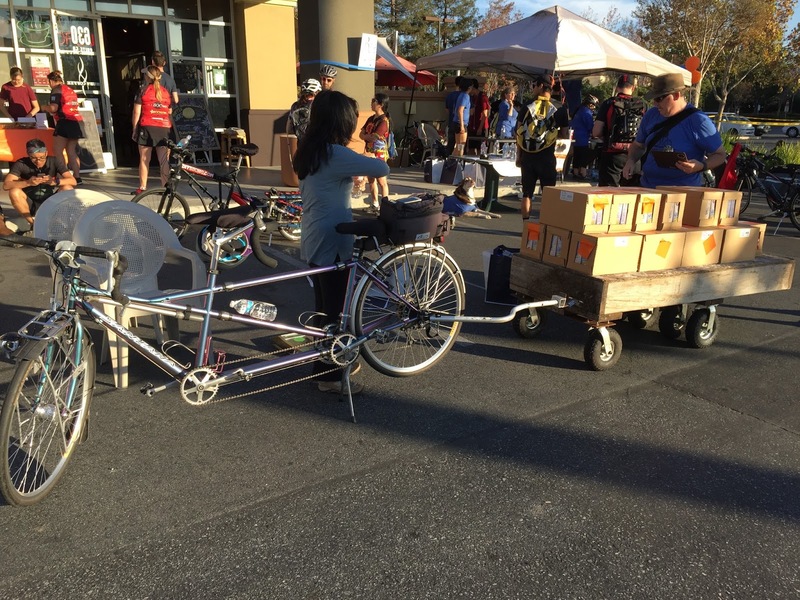 Last year, I loaded up my bike trailer brought food to Second Harvest Food Bank in San Jose. 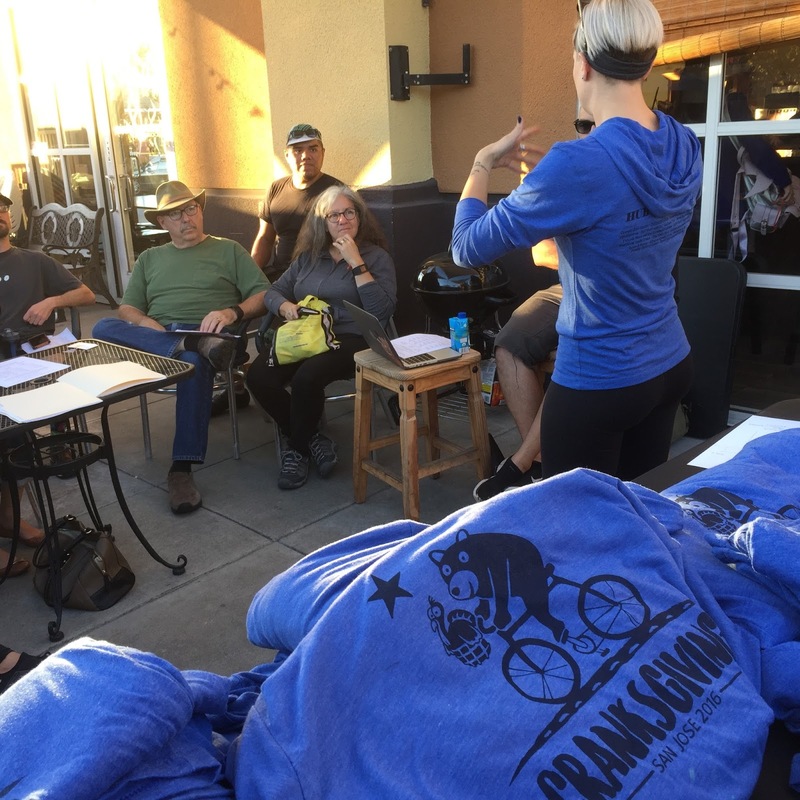 Not long ago, Cain, the founder of Cowgirl Bike Courier in San Jose, invited me out of the blue to a Cranksgiving planning meeting. From the invite, I learned it was a bike-based food drive that would benefit Second Harvest Food Bank. From the Cranksgiving web site, I learned Cranksgiving had been first founded in New York and been around since 1999 - not only predating #FoodBankBiking by over a dozen years but that meant it started back when I lived in rural New Hampshire (and I weighed 25 pounds more than I do now, ate fast food procured by car several times a week and considered Applebee’s a fancy dinner out). The rules of Cranksgiving can vary from city to city, but the Twitter-ready version of what’s going on in San Jose is this: cyclists get together at Cahalan Park, they are given shopping lists (manifests) of specific food items needed by Second Harvest Food Bank, they go out, lock up at different grocery shops, buy food, and meet back at Hub’s Coffee to weigh it all. Prizes may be awarded based on the time one finishes (safely - no prizes are given to those who ride recklessly to be the first one back) and other factors - such as the weight of the food they bring back - although the volume of all of the food put together is how everyone will measure the collective victory. I already know the bike I’m using for this event. But I’m not only a Cranksgiving participant, I’m also a sponsor. 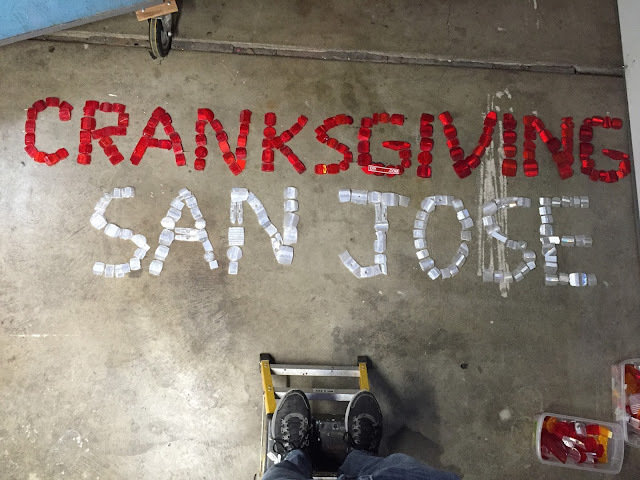 This is the first year San Jose has done Cranksgiving and I’m doing promotion when and where I can. It happily got me back in touch with Good Karma Bikes (which, by the way, is having a used bike drive tomorrow - between noon and 2pm October 22nd at 460 Lincoln Avenue) who agreed to help sponsor the event too. I’ve been to a couple of the Cranskgiving planning meetings already and as time goes on I’m still asking myself a key question that you may be asking yourself as well. Why didn’t I hear of Cranksgiving before? It isn’t at all unfortunate that cyclists don’t all speak the same language*. But it’s good to get involved with cyclists one doesn’t normally pedal with and for those who are in established biking groups to invite outsiders to come in. So what I want to do now is insist you should get involved too. There are plenty of good reasons - one of them is you get to focus on something on that doesn’t involve the 2016 Presidential Election. 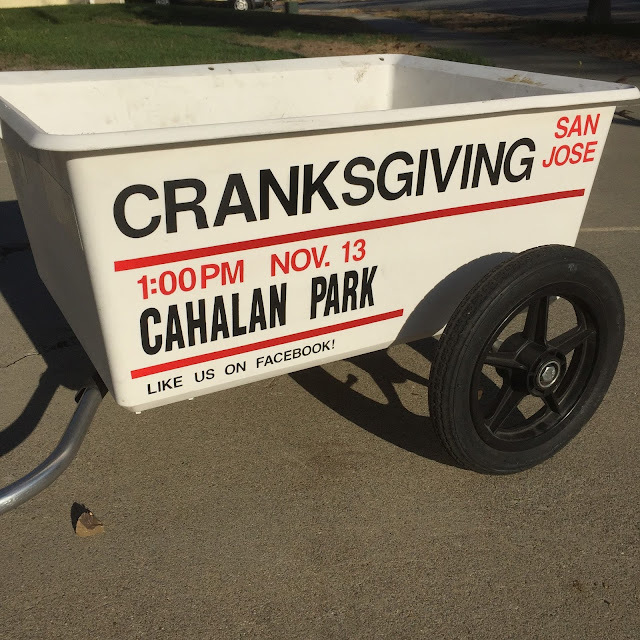 That alone should get you to visit Cranksgiving San Jose’s page to register for the event - which is November 13th at Cahalan Park at 1:00pm. 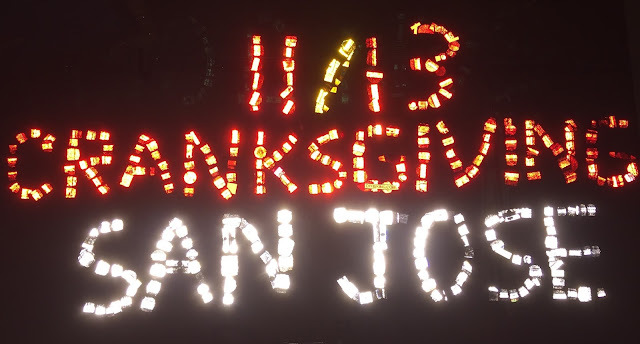 Also, if you live in Silicon Valley and want to help promote the event, like the Cranksgiving San Jose page on Facebook and share it with your friends. And you - yeah, YOU. Reading this in a faraway city. You usually ride alone but you’re known to show compassion toward others. You know there are hungry people where you live and you want to help them. Visit the Cranksgiving page that shows you how to start one up in your town. Remember the thirteen words: If you have a bike and can ride it safely, please ride it. If those thirteen words ring true for you, you can take part in Cranksgiving. Thanks for reading and thanks for riding. * I found out what an 'Alleycat Race' was about a week after I got confirmation of what 'On Fleek' meant.